Bed bugs are small, brownish, flattened insects that feed solely on the blood of animals. The common bed bug, Cimex lectularius, is the species most adapted to living with humans. It has done so since ancient times. Other bed bug species prefer to feed on wild hosts, especially bats and birds. 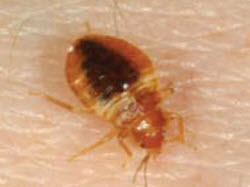 Adult bed bugs are about 3/16-inch long and reddish-brown, with oval, flattened bodies (see photo, below). They are sometimes mistaken for ticks or cockroaches. During the daytime, they prefer to hide close to where people sleep. Their flattened bodies enable them to fit into tiny crevices — especially those associated with mattresses, box springs, bed frames and headboards. Bed bugs do not have nests like ants or bees, but do tend to congregate in habitual hiding places. Characteristically, these areas are marked by dark spotting and staining, which is the dried excrement of the bugs. Also present will be eggs and eggshells, molted skins of maturing nymphs and the bugs themselves. Another telltale though less frequent sign is rusty or reddish blood smears on bed sheets or mattresses from crushing an engorged bed bug. Heavy infestations may have a “buggy” smell, but the odor is seldom apparent and should not be relied upon for detection. Bed bugs prefer to hide close to where they feed. However, if necessary, they will crawl several feet to obtain a blood meal. Initial infestations tend to be around beds, but the bugs eventually may become scattered throughout the bedroom, occupying any crevice or protected location. They also may spread to adjacent rooms or apartments. Avoiding problems with bed bugs is most challenging in apartments, hotels and other places where there are ongoing opportunities for the bugs to be introduced. Preventative inspection by A Bell Termite & Pest Control is the best way to uncover infestations in their initial stages when they are easiest to control. Homeowners should be vigilant when acquiring used furnishings, especially beds and couches. Curbside items should be avoided, and secondhand articles should be examined closely before being brought into the home, and perhaps laundered or placed in a dryer. Concerned travelers may want to get in the habit of checking their bed for signs of bed bugs, a common practice in the past. This would entail examining the bed sheets and upper and lower seams of the mattress and box spring, especially along the head of the bed. The incidence of bed bugs in the United States is increasing to the point where vigilance by all is a prudent practice.